Cosmetic Dentist Sacramento CA | Crooks & Enmark D.D.S. Sacramento Dentist - Crooks & Enmark, D.D.S. Achieve long term optimal oral health and a dazzling smile with the help of Drs. Crooks & Enmark, D.D.S. No surprises! You are part of the team. You are aware of and agree to any treatment we render and we make you aware of your financial investment in your dental care BEFORE we render any treatment. Everyone needs dental health care. At Drs. Crooks & Enmark, D.D.S. we welcome all patients of all ages. Welcome to Crooks & Enmark, D.D.S. Our pair of highly experienced dentists, together with their exceptional auxiliary team are devoted to enriching the health and appearance of our patient’s smiles. 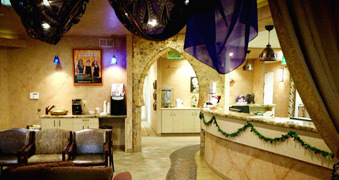 Servicing the Sacramento area, our Egyptian styled dental practice is a world away from the ordinary, often uninviting and sometimes uncomfortable dental experiences that some people may recall. A professional artist in her spare time, Dr. Crooks directed the design of our beautiful new office with the goal of creating a uniquely welcoming environment, full of warmth, comfort and attention to detail. The beauty of our Egyptian styled dental practice is designed to be a sensory indulgence for adults and an exciting adventure for children- an enjoyable experience for the whole family! Our team of highly experienced dentists are here to help protect and enhance the oral health of your family for life. Our team strives to forge healthy long term relationships with each of our patients and we look forward to seeing you soon! Dr. Crooks & Enmark, D.D.S. respect the link between your oral health and that of your entire body and as such, our innovative treatments are engineered to support oral and overall health and wellbeing. Their highly advanced treatment options are supported by the most innovative dental technology available such as laser dentistry, oral cancer detection devices and the highest quality implant dentistry techniques. These technological advances allow our team of dental professionals to minimize discomfort, costs and time spent in the dental chair all while enhancing the oral outcomes experienced by our patients. Our beautiful smile makeovers are built to last, which is why our dentists focus on building a solid foundation of oral health before any cosmetic treatments are rendered. At our dental practice located in Sacramento we comprehensively examine and assess the health and appearance of your entire oral area and facial contours to create a bespoke smile makeover plan tailored specifically to you and your needs. From Teeth Whitening to Invisalign and Porcelain Veneers, our wide selection of cosmetic dental treatments can help craft the beautiful smile you have always desired. Ready to Find Out More? Book an Appointment Today! Servicing the Sacramento area, our Egyptian styled dental practice is a world away from traditional uncomfortable unfriendly practices.